Jordy Hiwula’s second half strike gave Coventry their first back-to-back League One wins since October as they beat Southend 1-0 to end the year on a high. The Sky Blues upped the intensity in the second period and were rewarded for their efforts as Hiwula chalked up his fifth goal of the season. 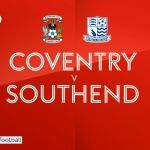 Coventry had a penalty appeal waved away by referee Kevin Johnson six minutes in as Conor Chaplin’s strike looked to have hit the hand of Southend full-back Elvis Bwomono. A well worked free-kick routine found Chaplin unmarked at the back post, but the striker squandered his volley into the stands.